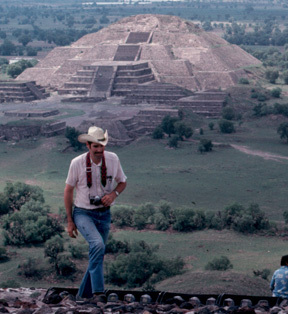 In 1980, at the end of my freshman year at Louisiana State University in Shreveport, I took a field course in biology from Dr. Laurence M. Hardy (left, at Teotihuacan), a man from whom ended up taking a lot of classes in my undergraduate days who proved to be an excellent mentor at the time as well as a great friend since. Hardy was tough and demanding (but fair and patient). My self esteem, not terribly well developed at the time, tended to regard any criticism as something equivalent to being sentenced to eternal damnation to a traffic jam on the Connecticut Turnpike. Hardy had reason to be critical of some of my performance. I was initially hurt by his evaluation of me at the end of the course -- for some neurotic reason, all I noticed was his negative portion of his critique (it was warranted, though). I took a few years to realize his words were accurate, his motives unquestionable, and his suggestions among the best professional advice I had ever received.
. . . Field work is always difficult; it usually involves poor working conditions, long hours, a relatively uncomfortable environment, and the drudgery of routine camp conditions. During the trip you showed a tendency to avoid camp chores (by standing around or being semi-busy with something that concerned you alone and not the group). Any field trip operates more smoothyly and with greater success and comfort for everyone when all participants cooperate and share the duties equally. The other members of the group will usually not tolerate (for long) having to constantly tell someone what to do, when to do it, or where to do it. On the other hand no one minds explaining how to do something. At first, I focused on these two paragraphs. I sulked for years. I failed to notice what followed. Your attention to study and self-improvement in biology is commendable and I encourage you to keep that healthy habit of study. Your enthusiasm and dedication is very good and was a postive influence on other members of the group. Hardy closed his evaluation with a handwritten note, "Overall -- a fine job!" I cannot remember when I looked at Hardy's evaluation with more open eyes, but I am extrememly grateful for what his assessment -- for both the positive and negative parts. The two paragraphs that I (wrongly) found so hurtful at first have helped make be a better colleague to work with, even just to be around, in the decades since. Hardy was one of four teachers/mentors named in the dedication to my book, "Upheaval from the Abyss." This site consists of a selection of the photographs I took while traveling as well as excerpts from my field notebook. Neither are complete. Some of the photographs are either redundant or of poor quality, while some of what I wrote in the field notebook was meant for my eyes only. Still, I hope this record provides an reasonably accurate impression of what I saw and did in Mexico on my first trip outside of my native country. 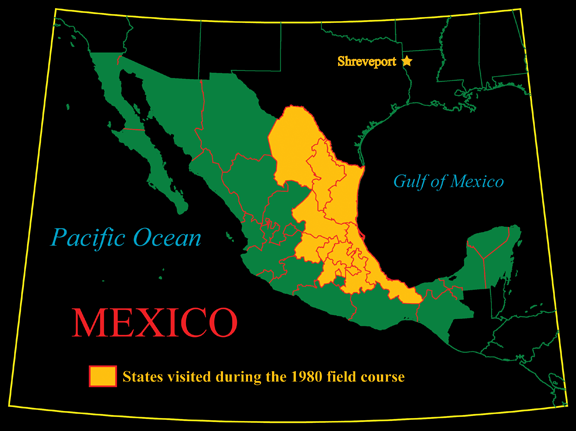 Choose the state of Mexico you'd like to see: Coahuila, Distrito Federal, Guanajuato, Hidalgo, México, Nuevo León, Puebla, San Luis Potosí, Querétaro, Tlaxcala, Tamaulipas, and Veracruz. NOTE ON THE MAP PROJECTIONS: The maps on this site were produced using a Conformal Conic projection, which shows the surface of the Earth as if projected onto a cone. I give praise to Charles Culberson's excellent Versamap program which allows me to produce the base maps. The map was shaded and annotated with Adobe Illustrator. Return to the fuzzo.com home page.